Siddhartha Gautama, called the Buddha, taught a method of experiencing reality over 2,500 years ago. The reality about which he spoke is only today being verified by the quantum sciences. Buddhism is a way of life that was developed just over 2,500 years ago in India. Since then, it has spread throughout Asia and into other parts of the world as well. Buddhism as it is practiced today has three major streams. Theravada Buddhism (the Teaching of the Elders) is the oldest stream and can be found in Asian countries like Sri Lanka and Thailand in the south. Mahayana Buddhism is the Buddhism of northern Asian countries like China, Korea, Viet Nam and Japan. The third stream is Vajrayana, the Buddhism of Tibet. Buddhism developed out of a wish held by the Buddha to overcome the suffering he experienced in life. It was not his intention to establish a new religion. He did not establish churches. He did not build altars nor organize rituals. Some of what he taught was based upon what he learned from others; more importantly, however, he taught based on the experiences in his own life. The Buddha was born as Siddhartha Gautama, a prince in a minor kingdom called Magadha located in northern India, and what we today call, Nepal. As the presumed future king of Magadha, he was given the education and training befitting this position. At the same time, because of a prophecy regarding a potential to abandon the worldly life, he was sheltered from the unpleasant experiences of life. The legend of his life tells us that he was so sheltered that everyday experiences as illness, aging, and death were kept from him until he was well into his teenage years. In the legends we are told that when he saw illness for the first time, he asked, “Did the sick bring this upon himself?” This was a reference to the then prevailing idea of karma and its mechanisms. The reply came from his servant. It was probably something the young prince did not want to hear. “All living things must endure illness.” Later, the same questioning arose regarding aging and death. It is told that he asked himself the same question that haunts many of us even today, “Why were we born into human life if only to suffer from one painful experience to the next?” Siddhartha later encountered a monk with a peaceful and content expression that he was told was walking the spiritual path, searching for answers to the mysteries of life. In this monk the Prince saw his own future; rather than succeed his father as king, he found a more important quest — finding a way to end his own suffering and that of all humanity. It was at the age twenty-nine that he left the palace. Tradition has it that he left his wife and son, his parents, and all the status and comforts of royalty behind to begin his spiritual voyage. He learned from the wise men in the forests, and eventually joined a group of five monks engaged in severe ascetic practice. 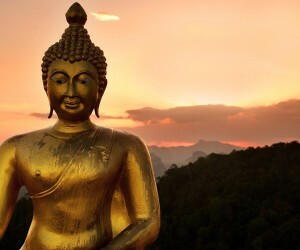 Through fasting and meditation, through subjecting his physical body to all manner of austerities, Siddhartha Gautama continued his search for spiritual insight. After six years of practicing the austerities he was reduced to mere flesh and bone teetering on the brink of starving to death. Reflecting on his life to that point, he realized that he had been living at the two extremes and that neither was conducive to awakening. It is here that he decided on the middle path, avoiding the extremes of luxury and self-renunciation. With lucid contemplation, he sat to reflect on meaning of life under what was to become known as the Bodhi tree. It was through this period of meditation in which he reflected on his own human experience. Through this action Gautama realized “enlightenment” and became known as the Buddha, the awakened one. The content of his awakening was first articulated as his first teaching, called the Turning of the Dharma Wheel, in which he explained the Four Noble Truths: There is “suffering”, there is a cause of that “suffering”, there can be an end to “suffering”, and the path leading to the end of “suffering”. The original word for suffering is dukkha, often expressed as a wheel with its axle out of alignment or an arrow that has missed its mark. It can mean “interruption” in many contexts. The wheel metaphorically represents our lives, does not turn smoothly because its essence is off-balance and eccentric. Prior to his awakening the Buddha saw life just as we do today; any experiences of suffering we incur are the result of external forces. There is a sense that there is always someone or something to blame for the way we feel. The Buddha lists the principal external causes as birth, illness, aging, being without those we love and being with those we dislike, and death. We believe suffering comes to us because illness comes visits us from outside, because the reality of impermanence causes aging and death, we suffer because people are can be unkind or because they do not understand us. In this way we make ourselves into victims. The Buddha saw that the one incontrovertible truth is that life is impermanent. It is our response to the transient nature of life that brings about all of the suffering. No matter how hard we try to maintain our health, we inevitably become sick. No matter how tightly we grip our youth, we age and grow old. No matter how hard we try to hold on to the people we love, there will always be a separation. His realization was that impermanence is impersonal; the changes that result are neither necessarily good nor bad in and of themselves. they are labeled good or bad depending on our reaction to them. The cause of suffering resides solely in our own minds and hearts causing our reactions to those changes. Suffering is caused directly through our own unawareness of the reality of impermanence. Because we are the cause of the suffering we experience that suffering can be averted. The way to obviate suffering is the Eightfold Path — the fourth of the Four Noble Truths. The legend says that the Buddha attained his enlightenment at the age of 35, and for the next 45 years, shared his understanding of life with nearly everyone he met. The truths to which he awakened came from his own experience of life. He experienced no from revelation from heaven. For this reason the teaching that arose from his experience contain no teachings presenting a mythology neither about gods nor a creator god. Buddhism is focused on this life and presents no definitive view or even speculation of creation or afterlife. Heaven and hell are presented as conditions we create here and now — not a reward or punishment after death. In its essence, Buddhism does not fit into the customary definition of religion. There are neither commandments nor beliefs its followers must hold to. It is the encouragement of a way of life enabling us to discover the meaning of our birth as humans beings and the true delight of living. In the 21st Century the Buddha has crossed national borders, spanned across faith systems and political ideologies, playing the role of a bridge to promote understanding giving good counsel toward our individual enlightenment and natural empathy. Disregard whatever you think of yourself, act as if you yourself were absolutely perfect. All you need is the courage to behave in accordance with your own best standards. Do not fear mistakes — they can be corrected. It is only your intentions that matter. The Buddha uncovered secrets of the mind and articulated them. These explanations are found in the Abhidhamma and Yogacara material. Contemporary neuroscience fully supports the Buddha's articulation of how the mind works. Without meaning there can be no suffering. Treat discursive thinking and obsessive thoughts like old tapes or CDs you are now bored with. When they start, ignore them and return to the present moment. Rational Amidism understands that Buddhism emphasizes what individuals can test in the container of their own direct experience. Except as an academic exercise, it has little interest in rituals, lineages or traditions, which have been built up over the centuries and often have no connection to Siddhartha Gautama, the historical Buddha or to the Dharma in general. Likewise, It is interested in a rational and Western Dharma, Buddhist teachings that seek to integrate psychology, modern science, contemporary culture and a twenty-first-century sangha, a Buddhist community that is of, by, and for the people living in this time and place.